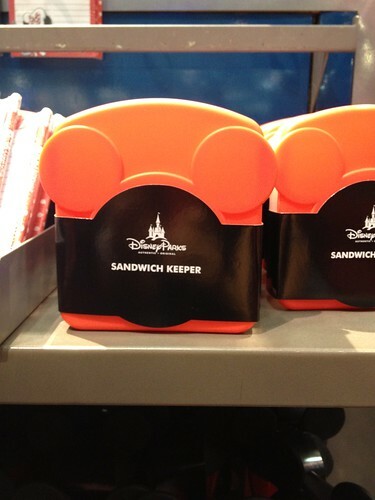 I mentioned a few weeks ago that I hoped to find some fun bento goodies while visiting Epcot in Disney World. 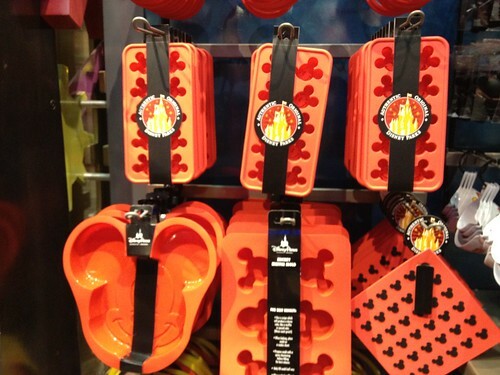 I did discover a few things there, and also some other lunch stuffs in other places on Disney property. Let's start with the miscellaneous mouse stuff. Mickey Mouse, that is. 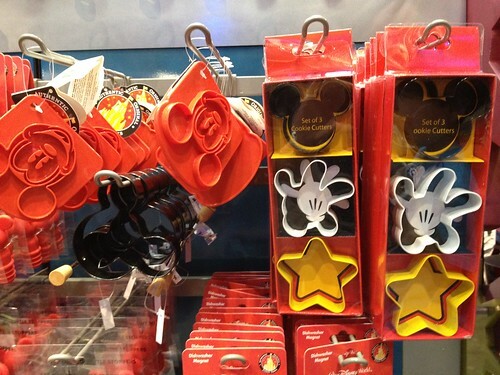 I kind of really liked the mini Mickey ice cube tray. 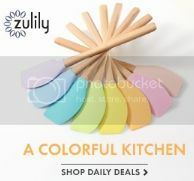 I just wasn't sure I'd get much use from it (beyond frozen yogurt bites), so I didn't get it. 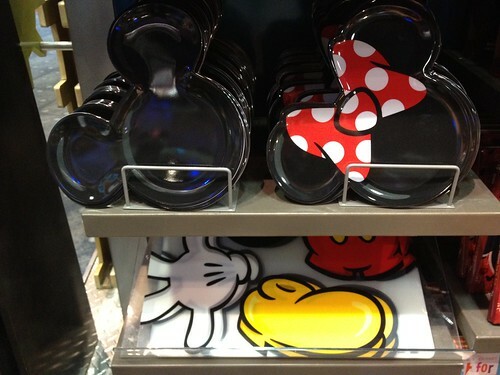 Of these items I only purchased the Mickey Mouse bread stamp (shown in this Mickey Mouse is in the... PlanetBox post). There were different things to be found at Epcot. 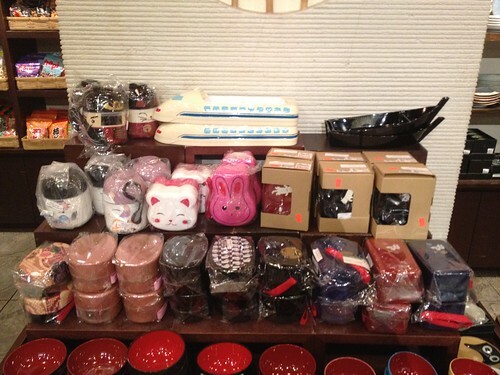 Epcot has a Japanese Pavilion in the World Showcase side of the park with an expansive shop of Japanese goodies. I could have strolled around in that place for an hour, easily. Instead, I walked briskly for maybe twenty minutes until my husband called me to frantically report that our natives were growing restless waiting outside. But I was able to take pictures of a few things before I reluctantly left. First, these were just inside the entrance and stopped me in my tracks. 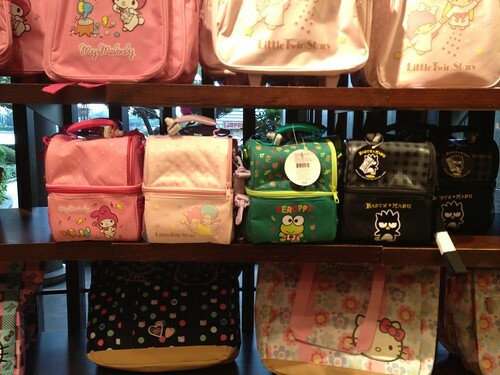 Sanrio lunch boxes. Swoon. They were designed with two sections, one upper and one lower. Sit upright. Long adjustable strap. Really nice thick insulation. I wanted one badly. I came to my senses and put back the one I selected (Keropi). I reasoned that I already have a literal mountain of lunch bags and just can not justify another one. 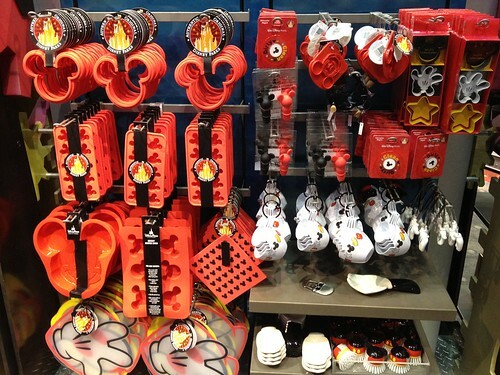 Although to be honest, had there been an actual Hello Kitty one I'm not sure I could have resisted. Beyond these lunch bags there were a couple Hello Kitty sandwich boxes, but nothing that really stood out. 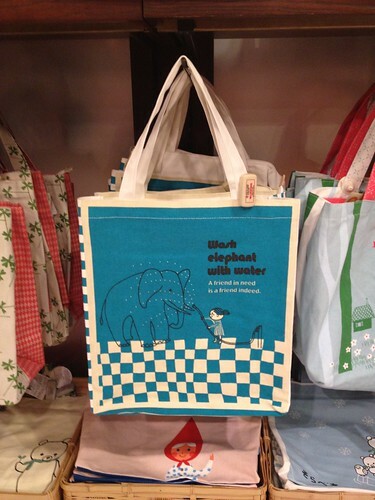 In case you can't read it, it says "Wash elephant with water" and then "A friend in need is a friend indeed". How hilarious is that? 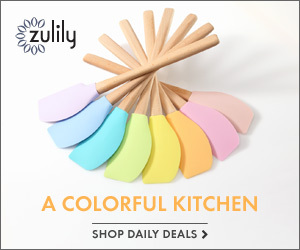 So kitschy and funny. That baby was SO going to be mine. Until I flipped over the tag and read the price - $45. That is so much money for a fairly simple canvas tote (it had a square bottom and zipped close at the top, but still). Wah! I keep pulling the photo back up on my phone to admire it every few days. So sad to leave it behind. 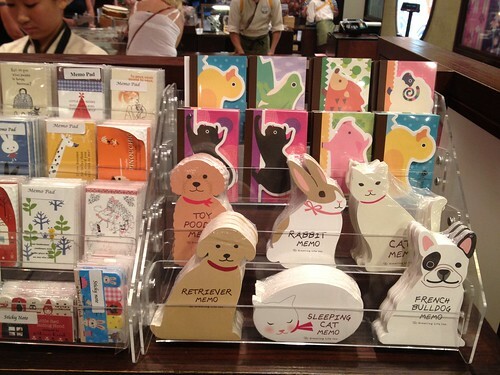 I'm not sure about all of them, but those in the back row, like the bunny and cat, are Kotobuki boxes. They are so nice. I already have a few of those and wasn't in the market to add to my stash, so I didn't pick any up. They were all priced in the $19 range, which isn't anything out of the norm for Kotobuki. I was really digging that big monorail tray at the top. The big monorail holds a removable dish with two or three sections in it. Such a fancy presentation for a meal! It was very big and totally not practical, but so cool. It's probably not really a monorail, it's probably that Japanese bullet train. Practically the same thing, I'm sure. The last area I browsed before being summoned back to my offspring was the snacks and foods section. I was drooling at this mint Pocky. Mint! I've never seen this flavor anywhere before. Mint and chocolate is my favorite. Yum! Some individual bagged snacks. How about some shrimp crispies? And lots of koala cookies (as shown in this Australia Love bento lunch in which I brilliantly showcased the continent upside down). 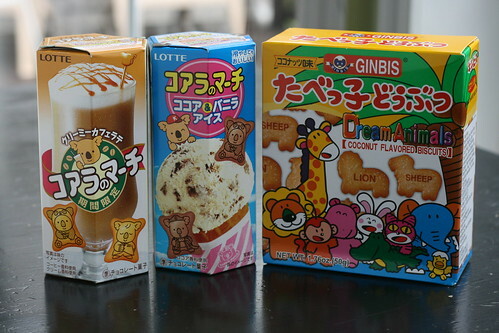 These are a lot like Panda cookies, that are pretty easy to find these days (I've seen them regularly at Target as well as World Market), but I've only seen koala cookies at a Japanese dollar store in CA before. 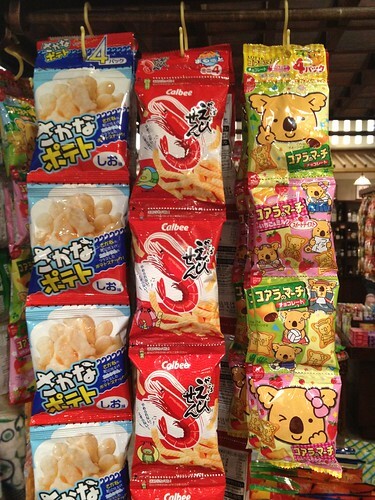 And that shop only had stawberry and vanilla, I think (same flavors as Panda cookies). But these flavors looked interesting! Some sort of coffee (?) 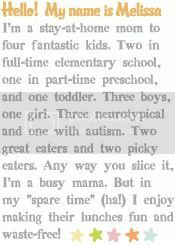 variety and one that shows a chocolate chip ice cream cone. As for what I purchased.... not too much. I couldn't resist those cute koala cookies, and these coconut flavored animal cookies also landed in my hand basket. I haven't opened those ones up to see, but I sure hope they really have the animal names written on them like they show in the picture! 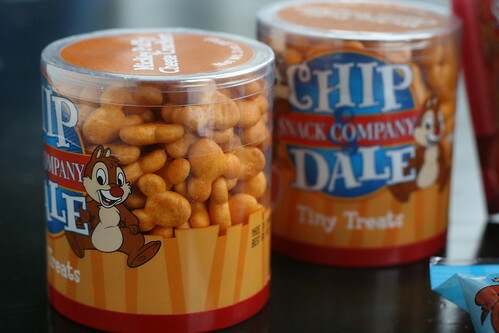 More foodie treats, these ones are not from the Japan Pavillion, but are the types of snacks available at just about every gift shop, candy shop, and bakery all over Disney World. 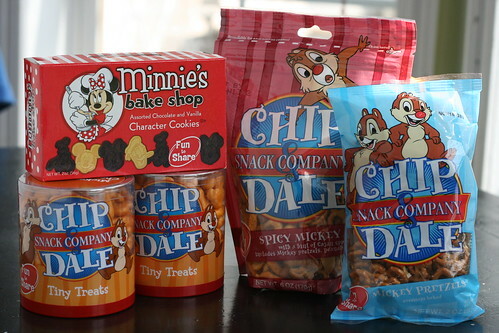 A spicy trail mix, Mickey shaped pretzels, Mickey cheese crackers, and some classic Disney character shaped cookies. Those Mickey shaped cheese crackers were the secret key to my Hidden Mickey bento! Loved this post. It was just like shopping for real! (Which for me also involves lots of looking and much less buying.) It was a great idea to bring back food to remind the kids of their trip later. I love all things Mickey Mouse (I'm actually wearing a Mickey Mouse sweatshirt at the moment...), so this is right up my alley. My favorite Disney snack is the Minnie Mouse peanut butter cookies. They are HUGE and SOFT and probably made with Disney magic. I've never seen the Mickey goldfish (goldMickeys? ), but I'm kind of dying over the cuteness. I've loved all the Disney talk, and understand your excitement. We live in Southern California and are lucky enough to usually have annual passes, so we're frequent visitors. I'm jealous of your trip to Disney World -- Epcot seems so cool! I love this post! I have so much fun when I am at Epcot. Thanks for all the eye candy! So very cute!! I think I saw a Kotobuki Box at HomeGoods. Now I just might have to go see if it's still there. 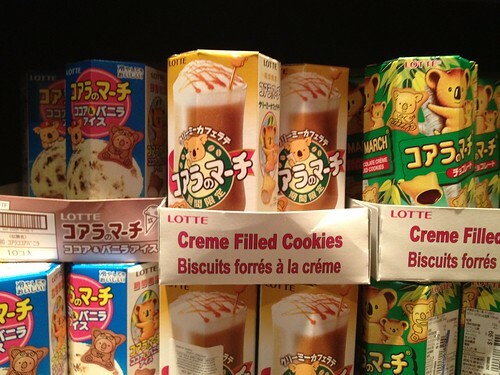 Ahhhh, you just posted some of my favorite things from when we lived in Japan! The Shrimp chips, the mint pokey. Mmmmmm! Lisa! Thank you for that tip! I am going to do that. Yippee! Kelly, you are lucky to live so close to the Magic! I grew up in CA and went to Disneyland frequently. It's where my husband proposed even. :) I haven't been since we moved to TN. I'm now a 1000% more obsessed with Disney and desperately want to go back to compare to Disney World. There are many things at the Magic Kingdom that feel funny to me because I know they are so different at DL. And I've never been to California Adventures. Ah, Disney! LOVE! Meredith - get out! I'll have to keep an eye out on my next trip to Home Goods. That's awesome. 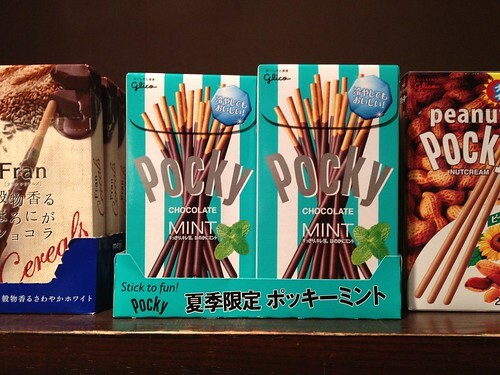 Oh man, mint Pocky! I've never seen that! I replied to you in my blog comment about the scalloped circle punch. It is 1 3/8" and it's Fiskars. I absolutely adore Epcot. Actually, I would love to go there without my kids! And probably my husband. Just browse slowly by myself! Thanks for the great Japan post. I live in Florida and we have passes, so I'll be there next month. I am definitely checking this out. Can't wait. I loved those koala bears when I was little and I thought the form of the box was very unique. But, we only had vanilla, chocolate and strawberry over here in Germany.